As I mentioned in my last post, teaching kids to compose and improvise can be two of the hardest standards to address. In it, I explained how my classes composed the blues by laying down the 12 bar blues chord progression and adding a melody based on the blues scale. When the kids finished this, they moved on to creating a background track they could improvise over. When we start learning to play the blues on ukuleles I use a background track to beef up our sound and fill in the holes we’re not ready to play yet. (You can read about how I introduce the blues on ukuleles in this post – just scroll down to Day 3.) Because of this the kids have an idea of what a background track is and what it’s used for. We again used Noteflight to create the background track – starting with the 12 bar blues chord progression and adding a drum part. Students were encouraged to create a rhythmically interesting chord progression and drum line. They loved working on this because DRUMS! There are several percussion instruments that can be added to a Noteflight score. I had my students stick to “Unpitched percussion/Percussion 1 Line”. The variation you see in the percussion “pitch” indicates low to high drum sounds and cymbals. The final piece of the students’ “Blues Portfolio” was a performance to improvise with the background track they composed. When I was a young trumpet student I was terrified to improvise. I’m sure it was because my teacher just said something like, “Ok, your turn, improvise!” I had no idea what to do, because as we know, while improvising means you make it up as you go, you still need some rules and structure to follow. The approach I’ve arrived at over the years is to provide a beginning structure with the fewest decisions possible. That mean improvising a rhythm on one note. When kids are comfortable with this, we move on and add another note. In the key of C, this usually means we start on C and add E flat when they are ready. As students progress they can add the rest of the notes in the Blues scale. We used ukuleles to improvise but you could also you keyboards or even Orff instruments. The Orff instruments are great because you can provide only the notes you want students to play. The blues scale on the ukulele follows a simple pattern. I learned how to do this from “Ukulele Mike” on youTube. Mike teaches you how to improvise in the key of D. To use the key of C you just shift everything down 2 frets. So instead of playing frets 5-3 on the A string, you play 3-1 on the A string, then 3-1 on E string, and 3-0 on the C string. I use this picture to help students remember the pattern. Finally, students performed their improvisation for me as their background track played. Some students even performed for the class. Improvising is a great way to individualize instruction for students. As I said above, students can add notes as they are ready. Some will stick to one or two pitches but many will challenge themselves to use all the notes of the blues scale. I’ve learned that students need LOTS of modeling to learn to improvise. They also need time to experiment and figure out what they can do – often without an audience. This was the first time my students improvised. It’s definitely something that we will spend more time on to develop their skills. By the way, I was able to take a few of my students to demonstrate their learning for our district’s senior citizen luncheon. They played the 12 bar blues and improvised! Whew! Here we are at part 4 of the Build An Instrument unit posts! and finally Part 4 – Compose and Perform! Our principal came in when we were in the midst of composing and asked, “How do you teach a kid to compose?” Luckily, I had an answer, but the truth is I taught many years before I figured out an approach. When I was in my undergrad theory classes and had to compose, the only guidance I remember is knowing some traditional chord progressions – and I wasn’t very successful. I’ve found the key to teaching students to compose is starting with a very limited structure – the fewer choices the better. For our middle school students, this meant composing in a modified Rondo form (ABACA) with 8 beats in each phrase. Every student wrote a solo following this form. They used traditional or non-traditional notation to indicate rhythm and where each note was to be played on their instrument. Since we had a wide variety of instruments there were a lot of different sounds. Another challenge was that most instruments didn’t play consistent pitches – so students notated pitches by labeling strings or making “fret” marks on their instruments and notating them in their music. Once students wrote their solo, they teamed up in groups of 2, 3, or 4. The group “sampled” their solos to create a new piece for their group. This new piece also followed the Rondo form by adding “D” and “E” sections for the groups of 3 and 4. Everyone agreed on a phrase for the group to play together for each recurring “A” phrase. Then, each student chose their favorite composed phrase to play as a solo in each alternating section. In the end, it looked something like this…. Overall, the results of this unit were outstanding. 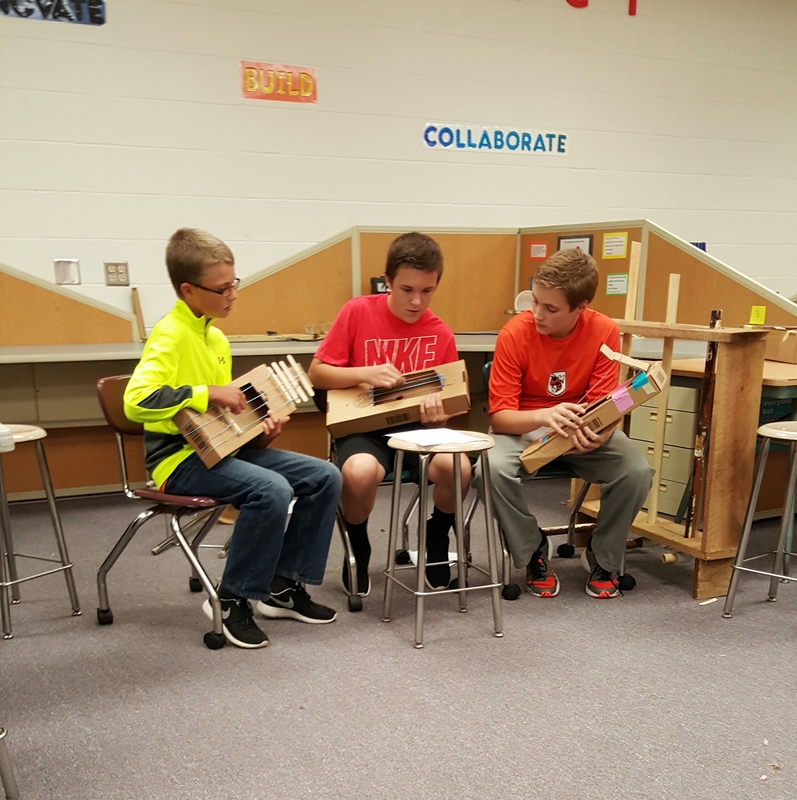 Students applied the science of sound to the instruments they built and more importantly, learned from trial and error. Most students did not end up with the exact instrument they first conceived – but many of the results were even better. Composing and performing was new for most kids, but many had very successful first attempts! We’re looking forward to see what else they can accomplish throughout the semester!